Suzzanne (Suze) feels blessed to have lived in Noosa with her husband and two boys for 15 years. 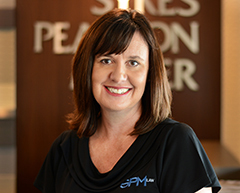 With over 20 years experience in marketing, project management, event coordination, media and small business management, Suze enjoys her role of showing the world how great the SPM Law -Sykes Pearson Miller team is! When she isn't playing taxi driver to her energetic, surfing obsessed sons, Suze loves to walk in the National Park, have coffee with friends and enjoys eating out at the many fantastic restaurants that the Noosa area boasts.